This article is about the Alaskan Native group. For the Siberian people, see Telengit. For other uses, see Tlingit (disambiguation). The Tlingit (/ˈklɪŋkɪt/ or /ˈtlɪŋɡɪt/; also spelled Tlinkit) are indigenous peoples of the Pacific Northwest Coast of North America. Their language is the Tlingit language (natively Lingít, pronounced [ɬɪnkɪ́t]), in which the name means "People of the Tides". The Russian name Koloshi (Колоши, from a Sugpiaq-Alutiiq term kulut'ruaq for the labret worn by women) or the related German name Koulischen may be encountered referring to the people in older historical literature, such as Shelikhov's 1796 map of Russian America. The Tlingit have a matrilineal kinship system, with children considered born into the mother's clan, and property and hereditary roles passing through the mother's line. Their culture and society developed in the temperate rainforest of the southeast Alaska coast and the Alexander Archipelago. The Tlingit maintained a complex hunter-gatherer culture based on semi-sedentary management of fisheries. An inland group, known as the Inland Tlingit, inhabits the far northwestern part of the province of British Columbia and the southern Yukon Territory in Canada. The greatest territory historically occupied by the Tlingit extended from the Portland Canal along the present border between Alaska and British Columbia, north to the coast just southeast of the Copper River delta in Alaska. 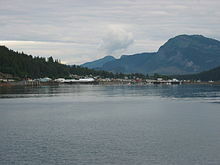 The Tlingit occupied almost all of the Alexander Archipelago, except the southernmost end of Prince of Wales Island and its surroundings, where the Kaigani Haida moved just before the first encounters with European explorers. The Coastal Tlingit tribes controlled one of the mountain passes into the Yukon interior; they were divided into three tribes: the Chilkat Tlingit (Jilḵáat Ḵwáan) along the Chilkat River and on Chilkat Peninsula, the Chilkoot Tlingit (Jilḵoot Ḵwáan) and the Taku Tlingit (Tʼaaḵu Ḵwáan:) along the Taku River. Inland, the Tlingit occupied areas along the major rivers that pierce the Coast Mountains and Saint Elias Mountains and flow into the Pacific, including the Alsek, Tatshenshini, Chilkat, Taku, and Stikine rivers. With regular travel up these rivers, the Tlingit developed extensive trade networks with Athabascan tribes of the interior, and commonly intermarried with them. From this regular travel and trade, a few relatively large populations of Tlingit settled around Atlin, Teslin, and Tagish Lakes, whose headwaters flow from areas near the headwaters of the Taku River. Delineating the modern territory of the Tlingit is complicated because they are spread across the border between the United States and Canada, they lack designated reservations, other complex legal and political concerns make the situation confusing, and there is a relatively high level of mobility among the population. They also overlap in territory with various Athabascan peoples, such as the Tahltan, Kaska and Tagish. In Canada, the modern communities of Atlin, British Columbia (Taku River Tlingit), Teslin, Yukon (Teslin Tlingit Council), and Carcross, Yukon (Carcross/Tagish First Nation) have reserves and are the representative Interior Tlingit populations. The territory occupied by the modern Tlingit people in Alaska is not restricted to particular reservations, unlike most tribes in the lower contiguous 48 states. This is the result of the Alaska Native Claims Settlement Act (ANCSA), which established regional corporations throughout Alaska with complex portfolios of land ownership rather than bounded reservations administered by tribal governments. The corporation in the Tlingit region is Sealaska Corporation, which serves the Tlingit as well as the Haida and Tsimshian in Alaska. Tlingit people as a whole participate in the commercial economy of Alaska. As a consequence, they live in typically American nuclear family households with private ownership of housing and land. Many also possess land allotments from Sealaska or from earlier distributions predating ANCSA. Despite the legal and political complexities, the territory historically occupied by the Tlingit can be reasonably designated as their modern homeland. Tlingit people today consider the land from around Yakutat south through the Alaskan Panhandle, and including the lakes in the Canadian interior, as being Lingít Aaní, the Land of the Tlingit. The Southern Tlingit occupy the region south of Frederick Sound, and live in the northernmost reaches of the Western Red cedar forest. Northern Tinglit live north of Frederick Sound to Cape Spencer, and including Glacier Bay and the Lynn Canal; they occupy the warmest and richest of the Sitka Spruce and Western Hemlock forests. The Inland Tlingit live along large interior lakes and the drainage of the Taku River as well as in the southern Yukon, and subsist in a manner similar to their Athabascan neighbors in the mixed spruce taiga. The Gulf Coast Tlingit live along a narrow strip of coastline backed by steep mountains and extensive glaciers, north of Cape Spencer, and along the coast of the Gulf of Alaska to Controller Bay and Kayak Island. Their territory can be battered by Pacific storms. The trade and cultural interactions between each of these Tlingit groups and their disparate neighbors, the differences in food harvest practices, and dialectical differences in language contribute to these identifications. These academic classifications are supported by similar self-identification among the Tlingit. The Tlingit culture is multifaceted and complex, a characteristic of Northwest Pacific Coast people with access to easily exploited rich resources. In Tlingit culture a heavy emphasis is placed upon family and kinship, and on a rich tradition of oratory. Wealth and economic power are important indicators of rank, but so is generosity and proper behavior, all signs of "good breeding" and ties to aristocracy. Art and spirituality are incorporated in nearly all areas of Tlingit culture, with even everyday objects such as spoons and storage boxes decorated and imbued with spiritual power and historical beliefs of the Tlingits. Tlingit society is divided into two moieties, the Raven and the Eagle. These in turn are divided into numerous clans, which are subdivided into lineages or house groups. They have a matrilineal kinship system, with descent and inheritance passed through the mother's line. These groups have heraldic crests, which are displayed on totem poles, canoes, feast dishes, house posts, weavings, jewelry, and other art forms. The Tlingits pass down at.oow(s) or blankets that represented trust. Only a Tlingit Indian can inherit one but they can also pass it down to someone they trust, who becomes responsible for caring for it but does not rightfully own it. Kóok gaaw, box drum, late 19th century. Image is of a sea wolf (orca). Tlingit thought and belief, although never formally codified, was historically a fairly well organized philosophical and religious system whose basic axioms shaped the way Tlingit people viewed and interacted with the world around them. Tlingits were traditionally animists, and hunters ritually purified themselves before hunting animals. Shamans, primarily men, cured diseases, influenced weather, aided in hunting, predicted the future, and protected people against witchcraft. Between 1886 and 1895, in the face of their shamans' inability to treat Old World diseases including smallpox, many Tlingit people converted to Orthodox Christianity. Russian Orthodox missionaries had translated their liturgy into the Tlingit language. It has been argued that they saw Eastern Orthodox Christianity as a way of resisting assimilation to the "American way of life," which was associated with Presbyterianism. After the introduction of Christianity, the Tlingit belief system began to erode. Today, some young Tlingits look back towards their traditional tribal religions and worldview for inspiration, security, and a sense of identity. 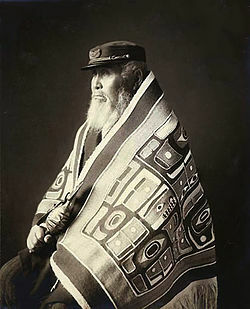 While many elders converted to Christianity, contemporary Tlingit "reconcile Christianity and the 'traditional culture.'" The Tlingit language (Lingít [ɬiŋkít]) is spoken by the Tlingit people of Southeast Alaska and Western Canada. It is a branch of the Na-Dené language family. It is well known not only for its complex grammar and sound system, but also for using certain phonemes unheard in almost any other language. Tlingit has an estimated 200-400 native speakers in the United States and 100 speakers in Canada. The speakers are bilingual or near-bilingual in English. Extensive effort is being put into revitalization programs in Southeast Alaska to revive and preserve the Tlingit language and its culture. Sealaska Heritage Institute, Goldbelt Heritage Institute and the University of Alaska Southeast have Tlingit language programs, and community classes are held in Klukwan and Angoon. Tlingit tribes often build communal longhouses, often made of cedar, along the lower reaches of rivers. Their plank houses have huge totem poles representing the pride they have of their ancestral demi-gods. Various cultures of indigenous people have continuously occupied the Alaska territory for thousands of years, leading to the Tlingit. Human culture with elements related to the Tlingit originated around 10,000 years ago near the mouths of the Skeena and Nass Rivers. The historic Tlingit's first contact with Europeans came in 1741 with Russian explorers. Spanish explorers followed in 1775. Tlingits maintained their independence but suffered from epidemics of smallpox and other infectious diseases brought by the Europeans. The Native Americans had no immunity to such endemic Eurasian diseases, which had entered Europe centuries before. Food is a central part of Tlingit culture, and the land is an abundant provider. Most of the richness of intertidal life found on the beaches of Southeast Alaska can be harvested for food. Though eating off the beach could provide a fairly healthy and varied diet, eating nothing but "beach food" is considered contemptible among the Tlingit and a sign of poverty. Indeed, shamans and their families were required to abstain from all food gathered from the beach, and men might avoid eating beach food before battles or strenuous activities in the belief that it would weaken them spiritually and perhaps physically as well. Thus for both spiritual reasons as well as to add some variety to the diet, the Tlingit harvest many other resources for food besides those they easily find outside their front doors. No other food resource receives as much emphasis as salmon; however, seal and game are both close seconds. Halibut, shellfish, and seaweed traditionally provided food in the spring, while late spring and summer bring seal and salmon. Summer is a time for gathering wild and tame berries, such as salmonberry, soap berry, and currants. In fall, sea otters are hunted. Herring and eulachon are also important staples, that can be eaten fresh or dried and stored for later use. Fish provide meat, oil, and eggs. Sea mammals, such as sea lions and sea otters, are used for food and clothing materials. In the forests near their homes, Tlingit hunted deer, bear, mountain goats and other small mammals. ^ Kan, Sergei (1999). Memory Eternal: Tlingit Culture and Russian Orthodox Christianity through Two Centuries. Seattle: University of Washington Press. p. 406. ISBN 9780295805344.
de Laguna, Fredericæ. "Tlingit." Suttles, Wayne, ed. Handbook of North American Indians, Vol. 7: Northwest Coast. Washington, D.C.: Smithsonian Institution, 1990: 203-28. ISBN 0-87474-187-4. Boyd, Robert Thomas. The Coming of the Spirit of Pestilence: Introduced Infectious Diseases and Population Decline among Northwest Coast Indians, 1774-1874. Seattle: University of Washington Press, 1999. ISBN 978-0-295-97837-6. Moss, Madonna. Northwest Coast: Archaeology as Deep History. Washington, D.C.: Society for American Archaeology, 2011. Pritzker, Barry M. A Native American Encyclopedia: History, Culture, and Peoples. Oxford: Oxford University Press, 2000: 286-7. ISBN 978-0-19-513877-1. Kan, Sergei. "Shamanism and Christianity: Modern-Day Tlingit Elders Look at the Past." Klass, Morton and Maxine Wiesgrau, eds. Across The Boundaries Of Belief: Contemporary Issues In The Anthropology Of Religion. Boulder, CO: Westview Press, 1999. ISBN 978-0-8133-2695-5. Olson, Wallace M. (2001). The Tlingit. An Introduction to Their Culture and History (Fourth ed.). Auke Bay, Alaska: Heritage Research. p. 110. ISBN 0-9659009-0-8. Shearar, Cheryl (2000). Understanding Northwest Coast Art. A Guide to Crests, Beings and Symbols. Madeira Park, British Columbia: Douglash & MicIntyre, University of Washington Press. p. 144. ISBN 978-1-55054-782-5. Stewart, Hilary (1979). Looking at Indian Art of the Northwest Coast Art. Madeira Park, British Columbia: Douglash & MicIntyre, University of Washington Press. p. 112. ISBN 978-0-295-95645-9. Duly, Colin. The Houses of Mankind. p. 55,58. Wikimedia Commons has media related to Tlingit. Anash Interactive—An online destination where users create comics, write stories, watch webisodes, download podcasts, play games, read stories and comics by other members, and find out about the Tlingit people of Canada.